Participants, planners, facilitators, and Arizona Science Museum staff enjoying some coffee-break sunshine during the eight-hour forum. Over the summer, Nich Weller wrote about the “power of conversation,” reflecting on a public forum in Boston that brought together public participants and facilitators and staff from the Museum of Science to discuss the challenges of sea level rise and extreme precipitation in the Boston area. The Boston forum is part of a national program, funded by the National Oceanic and Atmospheric Administration (NOAA), that engages communities to help them improve their resilience to climate-related hazards. 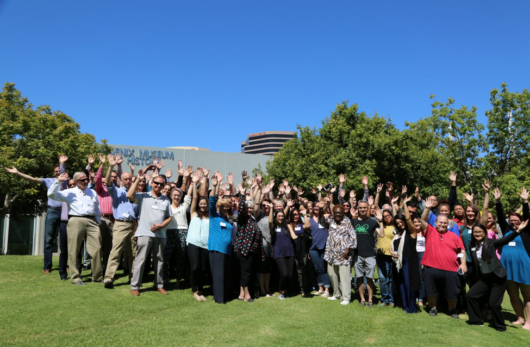 This past September, Nich invited me to facilitate at the second forum, hosted by the Arizona Science Center, with about 70 members of the public from the Phoenix metro area. Working from educational and deliberation materials related to drought and heat developed by Nich and his colleagues, participants shared their values, concerns, and questions, and proposed resilience strategies. Each group was provided with real data and visuals to understand the impacts of their choices and to evaluate—and reevaluate—their resilience strategies. Although participants shared a connection to Heattown—perhaps as a stand-in for Phoenix—and asked about and acknowledged the values and concerns of others with respect and genuine interest, there were still contested choices and contradictory perspectives on the best path forward for resilience. I noticed that part of the reason we were able to reach “consensus” was because participants were told that they didn’t have to agree with the majority at their table; their values and choices would be reflected in their personal worksheets, if not on the consensus game-board. This led me to question the value of the forum for consensus building. I witnessed thoughtful consideration of shared perspectives, but I didn’t notice much in the way of changing minds. First, I wondered, how is the consensus-building format of the forum any better than other kinds of decision making, such as voting or majority rule? According to the US Office of Personnel Management, consensus means “finding a proposal acceptable enough that all team members can support it, with no member opposing it.” But that doesn’t mean a unanimous vote or majority rule, because voting doesn’t require opposing parties to listen effectively to each other as they discuss their differences. This is why voting often proceeds more quickly than consensus building (i.e., a show of hands vs. an eight hour forum). Accordingly, at another table, forum participants resorted to voting whenever they felt their discussion was running behind the other tables, or that their discussion was stagnant. But despite its efficiency, voting has its downsides. Primarily, it creates losers (to the majority winners), and if the losing minority feels misunderstood and unheard, distrust and disgust with the process can fester. On the other hand, consensus building takes time because participants have to know and trust each other, and in the case of the forum, learn together, to work constructively and listen effectively. The participants at my table openly commented on the arduous process of reaching consensus and believed that it demonstrated the robustness of their consensus. They felt that although some parties disagreed with the consensus, all parties were heard. But they couldn’t quite articulate why that made the consensus acceptable. There were still majority and minority views, and there were certainly perspectives that were unaccounted for in the final resilience plans, even after a round of revision. Nich actually recorded data regarding this phenomenon, illustrating what I witnessed. We can celebrate that people were able to disagree without being disagreeable, but they didn’t often change their minds about what resilience plan they thought best. At my table, one person out of five changed his or her mind for drought and three of five choose the final plan that matched the table’s consensus. For heat, no one changed his or her mind, and again, three of five agreed with the table consensus. But across all tables, the data captured some compromise (with the caveat that we had a lot of missing data points): 43% of people changed their minds in drought and 20% did not (37% were unknown, missing the sheet, didn’t “follow the rules,” etc). And for heat, 45% changed their minds, while 23% did not (32% unknown). Where we saw changed minds, were they only willing to compromise because the stakes were relatively low? That is perhaps something we cannot answer unless we performed the forum under different conditions (real-life scenarios, no personal worksheets to turn in, etc.) Most of all, however, I wondered about the times when we did not see changed minds: what’s the value of a mind unchanged but understood? To get at that I had to let go of numbers and return to what I saw. First, under the conditions of the forum, there was a noticeable change to the tone and language of discussion. When I encounter people discussing climate resilience out in the world, it is rarely with the same respectful discourse and active listening. Forced and facilitated exposure to divergent perspectives breaks the bubble, so to speak. In other words, there was a noticeable effort by participants to frame their opinions in terms of the moral values of participants who disagreed with them, or at the very least to notice that differences of opinion were—beyond being “right” or “wrong”—rooted in different values. This is a remarkable and important accomplishment. In a joint study from the University of Toronto and Stanford University, researchers found that people often struggle with this feat in political discourse; it’s difficult to set aside personal reasoning and step into the perspectives and values of opponents. “Moral reframing,” as they call it, is a true exercise in perspective taking, and participants had their fair share of practice with it throughout the forum. Furthermore, because moral reframing helps you understand your opposition in terms of differing values, it alerts you to what your opposition is giving up when he or she compromises. And if you understand the stakes of the concession to build consensus, then perhaps in the future you might be willing to concede something in return (i.e., an exchange in political capital). In future forums it would be interesting to have note-takers observe the language and patterns of consensus building. Did compromises on drought policy earn a participant leverage when negotiating heat resilience? Science and democracy at their best are modest enterprises because both are mistrustful of their own authority. Each gains by making its doubts explicit. This does not mean the search for closure in either science or politics must be dismissed as unattainable. It does mean that we must ask and insist on good answers to questions about the procedures and practices that undergird both kinds of authority claims. We spill a lot of ink at our blog encouraging healthy (and scientific!) questioning the ability of science to address issues in the public sphere. We should be willing to explore the limits of our democratic solutions as well. Michelle Govani is a PhD candidate at Arizona State University. This post was originally published on the blog she writes with Nicholas Weller.